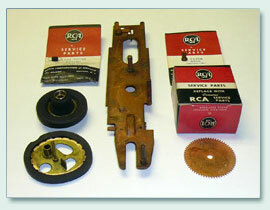 We have a selection of parts for the RCA 45 rpm player and the V-M 16 and 45 rpm player used in many brands of phonographs. Contact Us with the RCA or V-M part number of the part you are looking for. Cartridges for the V-M Model 630, 301 and 1500 series changers are available (Contact Us for details). 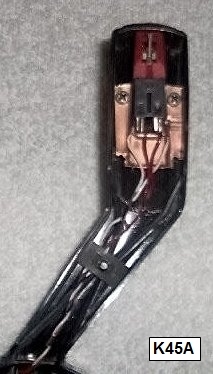 The RCA 45 changers were used as stand alone attachments and in numerous phono models – the less expensive versions had a 3 volt cartridge and the more upscale models employed a 1 volt cartridge. Cartridge kit - requires shell from original cartridge, not included with kit. This kit is based on the P188 cartridge with 0.7 mil diamond needle and is the most popular with enthusiasts. See picture of completed installation (upper right). Will play up to 14 stacked records. Cartridge kit - comes complete, and easiest to install for the novice. This kit is based on the P51 cartridge. Contains a 0.7 mil sapphire needle and is safe for both stereo and mono records. Diamond needle 700-D7 can be ordered separately. 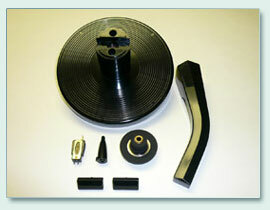 Stack and play less than 14 records; number can be increased by reducing height of screw bosses in tone arm. • For 3 volt models: Contact Us for information on what alternatives may be available.